09.09.2010 Updated the function “getUserInfo”. It no longer requires the list GUID for the user list to be specified in the script. 31.10.2009: Small update for default picture in the example CEWP. I use some code (“interaction.js” and stringBuffer.js”) created by Erucy and published on codeplex. You can call this script from any page. In this example i will place it on Default.aspx. Save this as a text file and rename to “AccessUserProfileInWSS.js”, then upload to the library as shown above. I will follow up this article with an article describing how to hide or show form fields based on membership – or not membership – in a SharePoint group. great work. I have been having an issue, but I do not think it is your script. In the past I was using firebug before I found out about IE Dev Tool. Uues a similar method identifying the user. for some reason I come up as user ID 1, which I always felt to be incorrect. Your script does the same thing and return the message no info for user id 1. Do you know why that might happen? what can be done to fix or change that? The variable _spUserId is supplied by SharePoint, but your page must be attached to a MasterPage for it to be present. I do believe that it is your ListGuid of your “UserList” that is wrong. please doubleCheck it. I will update the script i little bit to replace null-values with a blank string. I am not sure why it can write the _spUserId in the error message, but not write the details to the page. going to have to let it go for now. when I look through the interaction.js file I found references to a few URL. I could not open them in my browser, one was not found and another was error loading. could this be part of the problem? Did you check the list GUID of your UserList? The one supplied in the topmost codeview – line 20 – must be changed to match your List’s GUID. If you have tested with the code supplied unmodified and do not have a picture in your profile – you have to updated the code after i updated it to prevent null-values. Look at the code in line 33-39. I have not tested with a user without these permissions, but it may influence. User with id 1 not found. , and My info is user id 1. I will continue to play with this. Hopefully we can figure this out. also I added the alert line, but no alert triggers. Is your system WSS 3.0 or MOSS 2007? wss 3.0, I have not tried the changes yet. I will report back as soon as I get a chance. I would be highly interested in how Larry was able to get the CEWP to show the proper information. I have the same issue with the error “user with ID1 not found” populating each field instead of the accounts information. I’ve run the same tests, all positive, listed above by Alexander as well. The same error with another user login as well (except saying user ID8 in this case). I’m working on toward your next article on hiding form fields based on user permissions and would really like to find this a working solution. I wouldn’t think testing through a VPN would make any difference. Thanks in advanced. Does your site collection reside in a managed path, or on the root URL? The site in question is on a managed path. This is being hosted on an SBS 2003 install with the standard ‘Company Web’ and such as well as a few administrative programs that have their own site hosting for making configuration changes (ex. SpiceWorks). This site is on the default sites path. There is another site on the root but that seemed necessary to get the search function to work properly . . . It’s been awhile, but I clearly remember it being quite a pain. At any rate, yes this site is on a managed path. This is the path to where the web service “lists.asmx” is found. “sites” being the managed path of your site collection – modify as needed. I’m glad it worked! -I will update the post to avoid similar problems. @Alexander, I actually gave up on this script. I did not want to be a pest. I did however get another script to work, which is what I was referring to. Since I have seen the update here I went back to try and implement this again and much success. Thanks again. Now I can move on to the post that followed this one. Did you update the script to address the “Managed path” and got it working? k, I am back playing with this script. two questions, first i’ll start with the easy one. When I run this script I dont have a Pic for my details, so I get red x for missing images. is there a way to show the default shadow image if a pic is missing? I have updated the code in the CEWP to have a default picture. Can u please send me the stringBuffer.js and interaction.js file ? It is not me who have made these scripts, and i feel it it right that you get the files from the author directly. Sorry for the inconvenience, but to honor the author, please visit his site and download them from there. is it possible to display information of a client and not of the current user? the name of the client stands in the field “client” in dispform.aspx. there are several ways to prepopulate fields on the “NewForm”. One of the simplest is least secure is through the use of query strings. The DispForm should already have existing data which would make is easier to manipulate. Can you provide more details of what you’re trying to do? The “Show field:” in list settings for the people picker must be one of the “Name” options as this script gets the id from the link to the User information page. You are absolutely awesome Alex. So helpful to all of us. Thank you for the great work! I’m new to this, so I appoligize if this is a dumb quesiton… how do I know if my site resides on a managed path? If the site collection is not on the root, it is on a managed path. If the site collection resides on this address: http://acme.com, it is not a managed path. If it resides on http://acme.com/sites/YourSiteCollection, it does – and the managed pathe will be “/sites/YourSiteCollection”. Great, working like a charm, also with sharepoint foundation. “Define userListGuid (list guid of the user list on your root site) as variable accessible to this script”. Where do I declare that? Also, in my set up there’s different “people and groups” lists used for different sites. Is there one overall one I can access, or do I need to update it depending on which site the app’s running on? Also, the managed path reference seems to have gone. Is that not needed any more, or I am missing it somewhere? After the update 09.09.2010 i didn’t remove all traces of the “list GUID requirements”. I have removed them now – Thank you for noticing! Managed path is no longer an issue. In a site collection there are only one “Userinfo list”. Even if a subsite do not inherit security, all users and groups are defined in the site collection root. I got a bit confused by the rating system and seem to have rated my own comment. I finally figured out you vote for the article by clicking on the stars at the top. I assumed that was just a display originally. This scripts is exactly what I was looking for (and I lost count of how many I looked before)!! But I must have done something wrong because the user information that is showing is not mine.. Any ideas? And have you posted already the article about the membership? 1. Do you get a completely random result, or do you get the same result every time (the same person)? 2. Is it 2007 or 2010? 3. Is the site on a managed path? Anything else that might be worth mentioning? 1. I always get the same result. Each person that logs in get a single user, but also not the correct user. Could you please try to replace the text ‘UserInfo’ in line 25 in the code with the actual list GUID of the user list. To get the GUID, go to the “People and groups” list, right click – view source – search for ctx.listName. I don’t have access to the master site information, therefore I don’t know the exact reason for the difference. Great post (this and the related on on filtering views by group). I have 2 questions. The first is about security: do all authenticated users, even very limited ones, have access to the lists API via this sort of client-side scripting? Also, in 2010 (I realize you’re not explicitly supporting it) getItemById is returning null for all users I’ve tried (administrators mostly). I tried replacing the UserInfo reference with the GUID from _layouts/people.aspx. This is all related to 2010, so I may be swimming in my own creek. I think it would be available for all users, but it depends upon the configuration. It have to be tested in your local setup to be sure. This code should work in both 2007 and 2010, but might be a bit tricky if your site resides on a managed path. Can you provide some more info? – if possible, send me some screenshots. I liked this article. It helped me get the user profile properties. I’m now trying to display them within a content editor web part. But when I placed the “document.write” command in there, it shows only a white screen with my text. The rest of my SharePoint page does not appear. It’s frustrating. All I want to do is display the text. I look on jquery.com and other places and I find examples for all sorts of complicated things but not displaying text. I don’t want to do an alert window either. Please give me the answer here or email me. It’s really appreciable if you can help me quickly..
Hi, The CEWP is the Content Editor Web Part that is shipped with both WSS, MOSS and SP2010. Edit page and insert it into any webpage. Wow I have checked my installed Sharepoint 2007. But there is no such webpart. I found Picture and other webpart but not this one. 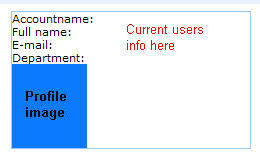 Can you tell me from where i can add this content editor webpart in my sharepoint 2007 ? Or something i need to active or like ? You should find it under the “Miscellaneous” section. If you do not find it, it may have been removed by your server administrator. thanks for the code and it worked with current user. But when i gave other user id like (domain\userid) it is returning the user is not found. I tried with different ids but the same result. The code found in this page does not support getting the user by login name. Follow the link to the new version in the top of this article. Hi I have a system used by many users and I have accessuserprofiels.js used on a list. It works for all users , but for one user it says”User with ID not found”. Can anyone help me with this please. I am not sure why it did not work when the script works fro 400 other users. Sorry for the late reply have you tested the new version? – this feature is not working in google Chrome v 32>=<v40 Can't find the user id. but anyway… in google chrome the feature is not working (neither 210/2013). This solution is 5 years old, and was created for SharePoint 2007. You find a link to a SP2010 solution in the top of the article, and if you change _spUserId to _spPageContextInfo.userId you can get it to work in SP 2013.